In my quest for the perfect home I’ve been doing all kinds of things. Purging stuff I no longer want or need. Giving things away, selling some, re-purposing others. I want a home thats comfortable, welcoming, a place where I feel I can relax and be myself and where my soul will feel peaceful. Most of the time I achieve clutter. Partly that’s due to the fact that I art & craft everywhere, not just in my office. I have an easel with an unfinished painting on it in the living room, along with the trolley I used to hold my materials. I have a side table and an ottoman acting as a work area and have commandeered one of the armchairs for night time crafting (mainly wiring and beading). I don’t want it to stop, but I’d like to come into a room and not have the heaps of stuff lying around needing attention: unwashed dishes, unfolded laundry, etc. I guess there are two solutions to this problem… 1. find myself a wife. Or 2. (probably more achievable) actually make time to do the housework. I saw this and thought how perfectly it described my life. In the quest for the perfect home I started looking at feng shui as a means to an end – the end being a home with a peaceful, fortune-ful and happy atmosphere. 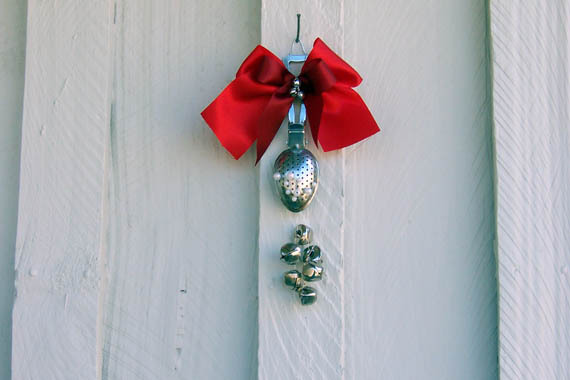 Somewhere in my readings I came across the lucky bells for the front door. 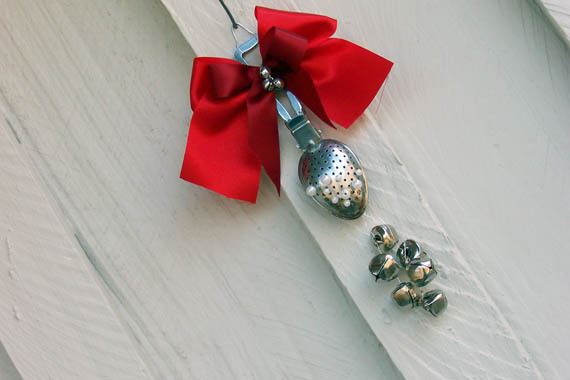 Apparently metal bells are best and they need a red ribbon or thread. Well, I have bells. I have red ribbon. So last night (when I should have been downshifting my brain in readiness for bed) I started this little project. Being me, I couldn’t just hang bells on the front door with red ribbon. I wanted something that said ‘zefi’… something old, something repurposed. Something interesting. And pretty. I found this old tea strainer spoon thingy amongst my collection of wind chimes paraphernalia. I created a double bow using two different widths and shades of red ribbon (in case the luck gods were particular about the red), threaded the bells on very fine wire – three lots of three bells (small for the bow and larger for the dangly bits), and for a bit of bling, added a few pearl beads to the strainer. Now every time our door opens it chimes to bring in good news and luck! This entry was posted in decorating, repurposing by zefiart. Bookmark the permalink.